Tatu City has graduated a third class of students from its training academy, continuing its programme to provide labour skills to hundreds of people in the local community. The training academy, in partnership with Arc Skills, teaches skills relevant to the construction industry, such as masonry, plasterwork, electrical, plumbing, painting, tiling and carpentry. 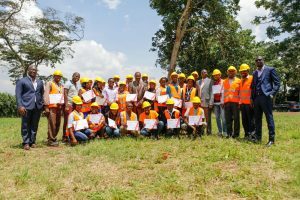 On completion of each six-week course, graduates are placed in construction jobs provided by contractors at Tatu City and the burgeoning development surrounding the project. Tatu City continues to set the standard for local content and training in Kiambu County. All contractors working at the project are required to hire from the local community. At present, around 2,000 workers are currently on-site. Paul Kosgei, Director General for the National Industrial Training Authority (NITA) lauded the Tatu City’s efforts to support the local community. “We are very supportive of what Tatu City is doing in the development of skilled labour. NITA has been pushing for the implementation of the Kenya Employment and Opportunities Project which has embraced the apprenticeship model toward achieving the goal of competent youth,” said Mr. Kosgei. According to a survey by the Kenya National Bureau of Statistics (KNBS), released in March 2018, seven million Kenyans are currently unemployed. With the fast pace of development at Tatu City, the demand for skilled workers is increasing and the graduates are readily absorbed into the project by contractors. Tatu City will create tens of thousands of employment opportunities throughout the development of the 5,000-acre Special Economic Zone.